Chileans’ love of soccer is developed from their very early years. Like most of the world, soccer is the biggest sport in Chile. Kids of all ages play soccer in the street, empty fields, or anywhere there is a ball. Our churches frequently have little soccer fields in the back. 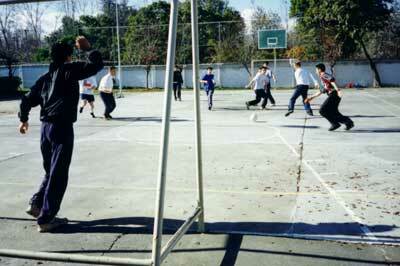 These “canchas” are a smaller playing area made of concrete and facilitate games of “baby fútbol,” or baby soccer. From the moment I arrived in Chile, every kid on the street would ask: “¿de qué equipo soi?” or “what’s your team?” At the time there were 3 big soccer clubs: Colo Colo, la Universidad de Chile, and la Universidad Católica. Although these were the most popular, there are dozens of teams and huge soccer stadiums throughout Chile. Regardless of their individual favorite team, all Chileans unite to cheer on their national soccer team. When the Chile team plays internationally, the entire country holds its breath as it waits for the outcome. Read more about the games Chileans love in the Gringo’s Culture Guide to Chile.